Today I attended the Fight Fascism on Brazilian Campuses protest in the SOAS square, hosted by Brazilian Woman Against Fascism UK, the DCE UFF Fernando Santa Cruz (the Federal Fluminense University in Rio de Janiero) and Ele Não Students London (meaning ‘not him’ in Portuguese). The show of solidarity was in direct response to the silencing of anti-fascist protestors and invasion of university campuses by police and military personnel to question known left-wing students and professors. 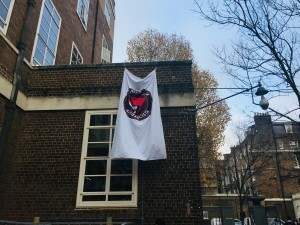 The UFF hung an antifascist banner on their campus until it was forcibly removed by the university on the 23 October, and so a new anti-fascist banner was hung here at SOAS in support of the bravery and activism of UFF activists. The protest was an emotional one, characterised by the fear and the anger of several Brazilians about the plans of Bolsonaro for our beloved country. Bolsonaro was elected to Brazil’s presidency at a time when the nation is suffering from recession, soaring crime rates and a deeply rooted and painful frustration at the continuous corruption of the PT (Partido dos Trabalhadores – or Workers Party) that many believe has devastated Brazil’s once lauded reputation of progress and growth. Never-ending parallels have been drawn between Trump and Bolsonaro, whose military background and right-wing zeal have propelled him to the role of political strongman but left many afraid of what he espouses. Here are just a few little things Bolsonaro openly despises: women, LGBT+, people of colour, survivors of the military dictatorship, left-wingers and environmental regulations, and poor people. Yet with 55% of the vote in a country where voting is mandatory, it seems that his rhetoric appeals to a majority, not a minority, which is the most terrifying reality of all. Who would vote for such a man? ‘Evil people.’ That was the response by two vocal Brazilian women spearheading the protest when I addressed the crowd and asked them to look at our brothers and sisters who voted for him with a degree of compassion and understanding. I reminded them that many Brazilians are desperate, creeping closer to the poverty line and feeling disillusioned with the once glorious PT. I touched on the continuous corruption scandals plaguing Brazilian politics and the virtual collapse of public services that has left several people I know in despair. Angrily, they replied that the millions of people who voted for Bolsonaro were full of hatred in their hearts, and were against ‘people like us’. I disagree. Whilst I cannot condone voters’ (including several of my family members’) decision to choose Bolsonaro, it is essential to remember that many of us protesting are either expats or possess the means to live and study here in London, and thus have a layer of privilege many voters in Brazil do not have. America’s failure to understand the frustration and suffering of disenfranchised southern white people for decades led them to back Donald Trump. Yes, he stands for racism and misogyny, and I’m sure many of his supporters do too. But many also looked at the alternative and saw nothing there that would help them with their struggles. Someone very dear to my heart looked at the only credible opposition this year in Brazil and saw nothing, and no one, that would help her. So, she voted for Bolsonaro, and was quietly both uncomfortable and defensive when he won. When looking at the sudden right-wing revolution that seems to be curling its tentacles around the Americas, it is important to do it with some humanity. 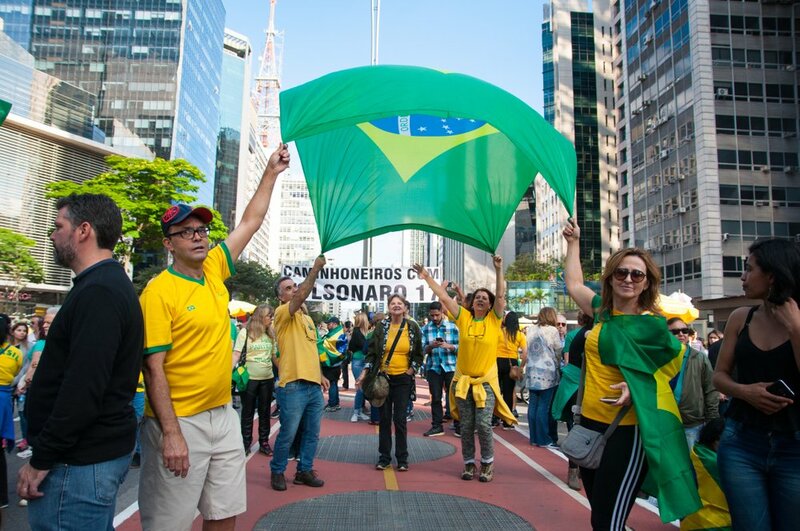 Voters in Brazil have made a decision many of us believe is a terrible mistake. That does not make all of them evil, nor does it make them good, misguided people. It’s just not as simple as that, and I would encourage all protesting against Bolsonaro to remember that when caught between a rock and a hard place, there can be no soft landing.